BEADED OVALS Covered Sugar.-- no (IG) mark. Courtesy Jerry & Carol Curtis. Hollow knob prior to (IG) Trademark insertion. Courtesy J & C Curtis. (IG) Aurora Jewels color (cobalt) covered sugar. BEADED OVALS - or #975 in Reproduction carnival glass lines produced between 1962 and 1981. 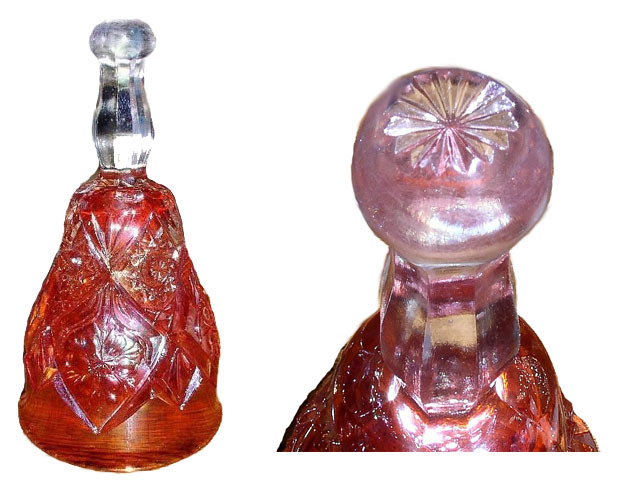 This covered sugar has a hollow knob when produced in earlier Imperial production, along with a rayed base. It had no IG trademark. Although Carl O. Burns does not refer to the Beaded Ovals in his Imperial book, he does provide pages from later Imperial production displaying this item as #975. Rubigold (marigold) White, and Sunset Ruby. Jerry’s photo also indicates Aurora Jewels (cobalt), as a 1970s repro. color. 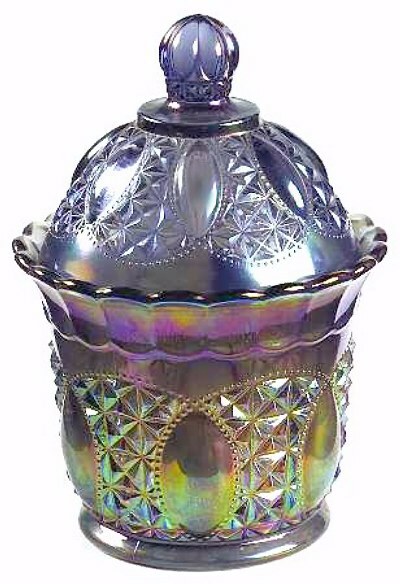 This covered sugar was originally part of a four-piece table set called “Optic Mirror” Table Set Asst. seen in a 1906 Butler Brothers Wholesale Catalog ad. 8.5 in. x 3 in. deep. 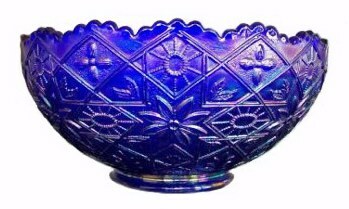 Purple HATTIE Bowl - scarce! 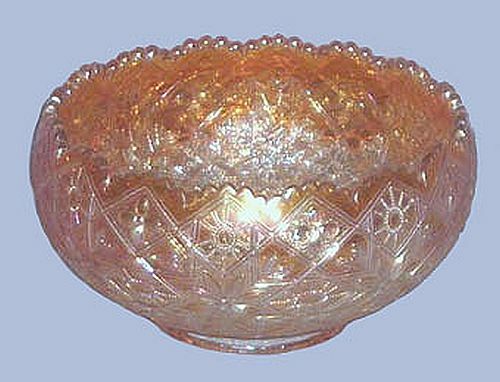 HATTIE Rose Bowl - Rare - 6.75 in. diameter x 3.5 in. high. 8.75 in. Marigold HATTIE Bowl. Left - 8 in. new (repro.) HATTIE (IG on bottom) (Aurora Jewels (cobalt-1972). Right - (repro) White HATTIE (IG) 7.5 in. diameter.(1972). 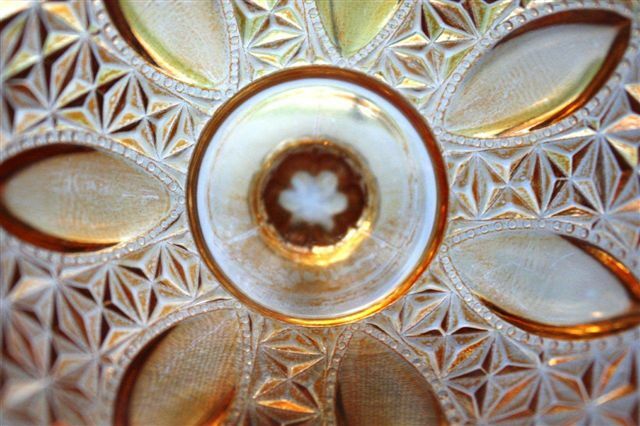 HATTIE: A rose bowl in this pattern could be considered rare! Marigold, amber and purple are colors to look for. Vintage round bowls, some 8” in size are found in marigold, purple, helios, smoke and amber. 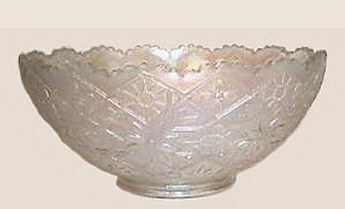 Reproductions in the bowl shape are all marked with the IG trademark and were made in smoke, green, pink, and white during the 1960s and 1970s. Purple and Mariigold 474 Compotes. FOUR SEVENTY FOUR: The name comes from the original factory catalog, naming it Imperial #474. We display several other shapes within this pattern. (See Alphabet - F). The marigold and purple compotes shown here are the only two colors found in the vintage variety. Purple compotes are extremely rare! 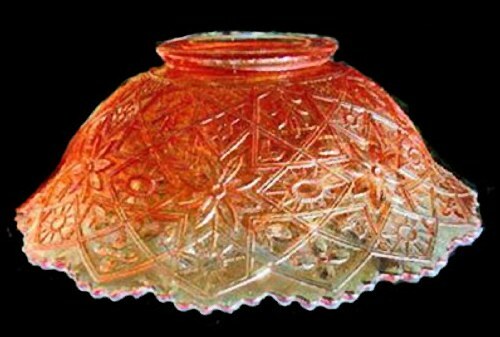 Reproductions of the compote in helios are known. All items reproduced in the ‘60s & ‘70s should be marked with the IG trademark. 474 Goblet, Wine and Cordial. 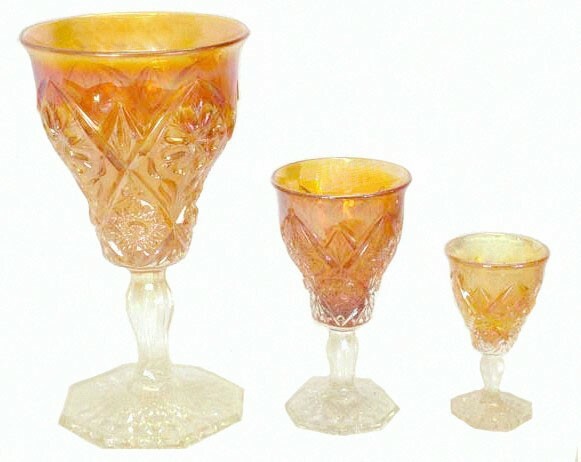 Goblet, Wine, Cordial: The Goblet is scarce in marigold, rare in helios or purple. The wine is rare; found only in marigold. The cordial in very rare in marigold and purple! Wire attaches crystal clapper which is 1/2 in. diameter. Bell: Richard Fenton provided the photos of this bell-shape ( 4/22/13). “Someone” has inverted a wine, ground off the foot, leaving a slight bulbous end for applying the “star” after re-heating the glass to accept the stamp. From time to time over the past 25 or so years, we have seen and discussed such oddities with various collectors while attending auctions/conventions. The Cleveland, OH area has been mentioned as suspect from which these “garage operation” tinkerers create “new forms”. Richard says the bell height is 4 1/8”. Width of bottom opening is 2 1/8”. The crystal clapper is ½” wide. 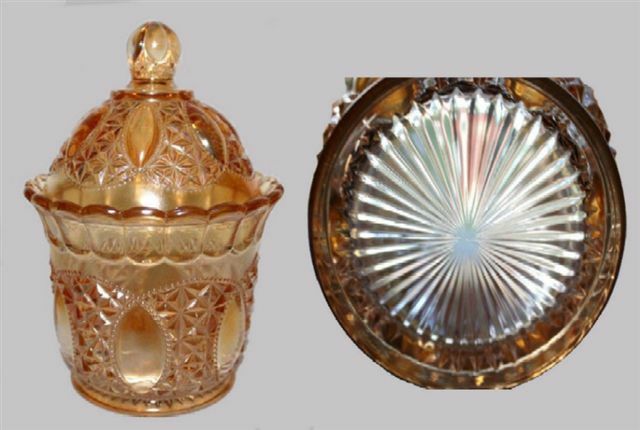 He purchased the bell @ Medina Antique Mall for $3.75, believing that perhaps an Imperial Glass worker created a few of these to use as gifts? Replacements.com offers some rather unique services. 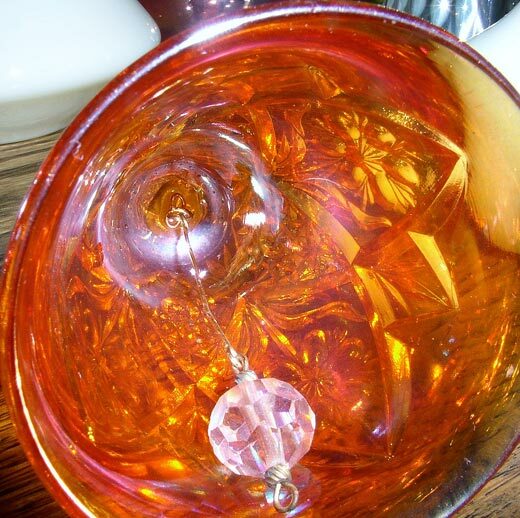 If your crystal pattern has a goblet, they will make you a bell. 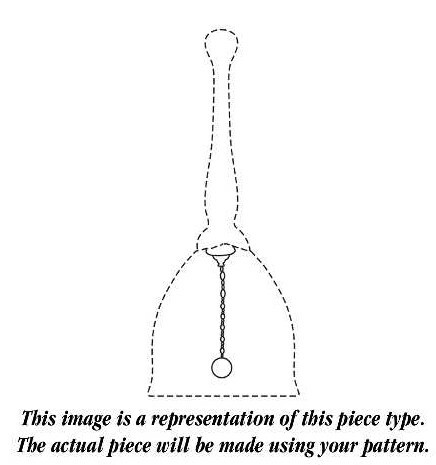 Below is a picture showing one of the bells they can make. The actual bell is made in your pattern. 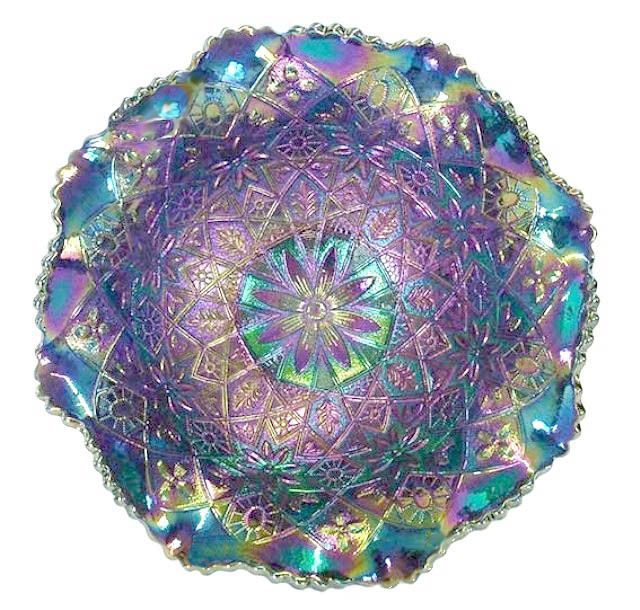 The site also offers to make cake stands and night lights in your pattern. The cake stand is a dinner plate with a hole drilled in the middle and then the plate is bolted on a metal stand. The night light is a cup cut in half so it will fit snuggly against the wall, a small bulb and plug placed inside. Seems harmless and kind of neat, BUT, sure adds to the confusion when these items show up at flea markets and online. One of the services offered at Replacements.com. Finding out what is acceptable to the Lord. But all things that are exposed are made manifest by the light, for whatever makes manifest is light. Therefore He says: “Awake, you who sleep, arise from the dead, and Christ will give you light”.